Time Spiral. The first book of a trilogy that both wraps up the storylines began since The Brother's War was released. The era of the all-powerful planeswalker is coming to an end and the rise of a new kind of planeswalker (and the introduction of the planewalker card) is beginning. My expectations going into this book a strong sense of nostalgia and witnessing all kinds of conclusions and consequences to previous storylines. Not having read all the previous novels as I read this for the first time, I also expected some of the information about Dominaria's history to be quite new to me, so I'd be going into this book part in the know and part in the dark. Before the Invasion of the Phyrexians to Dominaria began, the Planeswalker Teferi phased out both his homeland of Zhalfir and the homeland of his best friend. Teferi and Jhoira return as Shiv is ready to return to reality, but they return to a Dominaria that bears little resemblance to the one they once knew. Jhoira's homeland of Shiv is the first to return, but with the rifts in reality and time littering the plane, the slightest mistake could destroy not just Dominaria, but the multiverse itself. 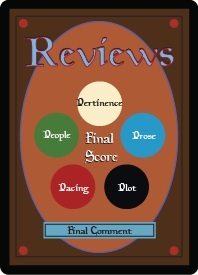 The plot of the book is fantastically epic in scope, but the story depicted is very internal in nature. 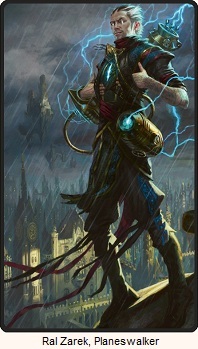 As one of the old style planeswalkers, Teferi is literally no longer made of matter and can teleport where and when he wants, so the book is much more about recruiting allies to his side and solving the mystery of the rifts rather than facing physical challenges. This isn't a book about a hero setting forth from his home to stop the villainous being that is terrorizing his home, the enemy he faces is the unstable state of the universe and the book tackles that problem in a very fitting manner. The story flows very nicely. While there are some characters that can get tiresome in large amounts, the book changes at the right moments to keep things fresh and interesting. While there is action spread throughout the book, a lot of the tension is built upon confrontation amongst the characters as well. The book takes its time to explore the characters and the state of ruined Dominaria. And that's a good thing. It's clear at this is the beginning of a trilogy, and ends on a teaser for what's to come, but it has a good stopping point. Teferi is intentionally a bit arrogant and childish which is wearing at times, but I can't complain too much when he's being written true to character (as far as I can remember), and that flaw in his character is explored throughout the book. On top of that he's always paired off with characters that play against his personality beginning straight away with Jhoira who is fantastic throughout. As for our cover character Radha, she doesn't have too much depth to her but she's written in a way that it actually comes off pretty admirable at how straightforward she is. And the rest of the cast is fantastic. There's a great assortment of personalities that are assembled for the book. This book is just dripping with pertinence. This is such a self-referential book when it comes to the history of Magic's storyline and cards. While we don't get to see as much of Dominaria as I was expecting, ruined and bleak plane is depicted wonderfully. 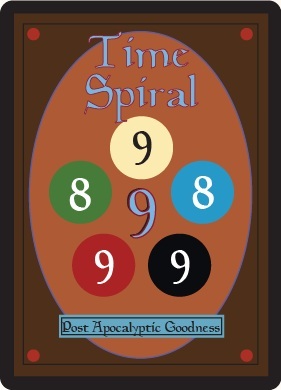 Time Spiral Block is the nostalgia block, and the novel is a great at representing that concept through providing a satisfying amount of people and cards from the current set as well as people and cards from Magic's past, on top of weaving all the major events of Magic's past as being the direct cause of the current crisis. There isn't too much to complain about here. McGough does a good job in getting into the heads of everyone and making us understand what they're thinking, experiencing, and witnessing. The oppressive environments are clearly visualized and McGough conveys tension, frustration, and satisfaction as the scenes dictate. The worst that can be said is that there are some dialogue choices that fell flat for me. They didn't ruin any scene, but during those moments I wasn't as engaged as much as he intended. I came into this book partially in the know and partially in the dark, and book worked for me both the instances where I understood the references and where I did not. You'll be better served being familiar if you're familiar with Magic's history, but I'm sure this book would work great even for those who are only familiar with the story with just the barest of details. (Although reading this without any any familiarity is not recommended.) 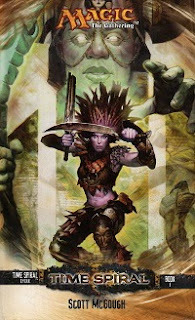 The book is great at showing what a fragile state Dominaria, and the multiverse, is in, and does a great job in exploring the characters who are determined to solve the problem, as well as those that are pulled into the cause. The multiverse is on the brink of destruction and I can't wait to see how it all turns out.